The WTA Series Hydraulic Analyzer is a simple compact design allows for simultaneous measurement of flow, pressure and temperature on Mobile Industrial & Agricultural equipment. Its painted high quality steel case enables the WTA Hydraulic Analyzer to withstand the most rigorous of use in the field. The WTA can be connected aw “Inline” between the pump and valve for convenient machine testing in all environments. Reversible Flow Indicator: The WTA will allow full flow to pass through in the reverse direction at low pressure but will not measure the reverse flow. This can be useful in situations when the flow and direction are uncertain or a cycle requires reversing, via the raising and lowering of a cylinder. 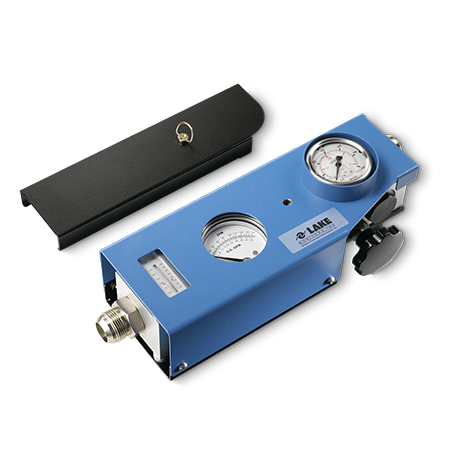 Easy Connection & No Power Required: The WTA can be connected “In Line” between the pump and valve for convenient machine testing. Rugged and Reliable: Manufactured in a painted high quality steel case with removable lid. The WTA can withstand the most rigorous of use out in the field. Loading Valve: A loading valve allows you to simulate pressure on the hydraulic system without the need to operate all the machine functions in the workshop. The multistage valve design assures low handle effort and smooth operation over the entire flow and pressure range. Built-in Thermometer: Heat stressed hydraulic fluids can be a major factor in component failure. The thermometer, calibrated for both °F and °C is a carefully designed and integrated part of a high quality unit, not a boltedon afterthought. 68 – 176°F (20 to 80°C) continuous use. Intermittently (< 10 minutes) up to 230°F (110°C). A range of burst discs are available – please consult factory. *NOTE: This unit is not designed for permanent installation.